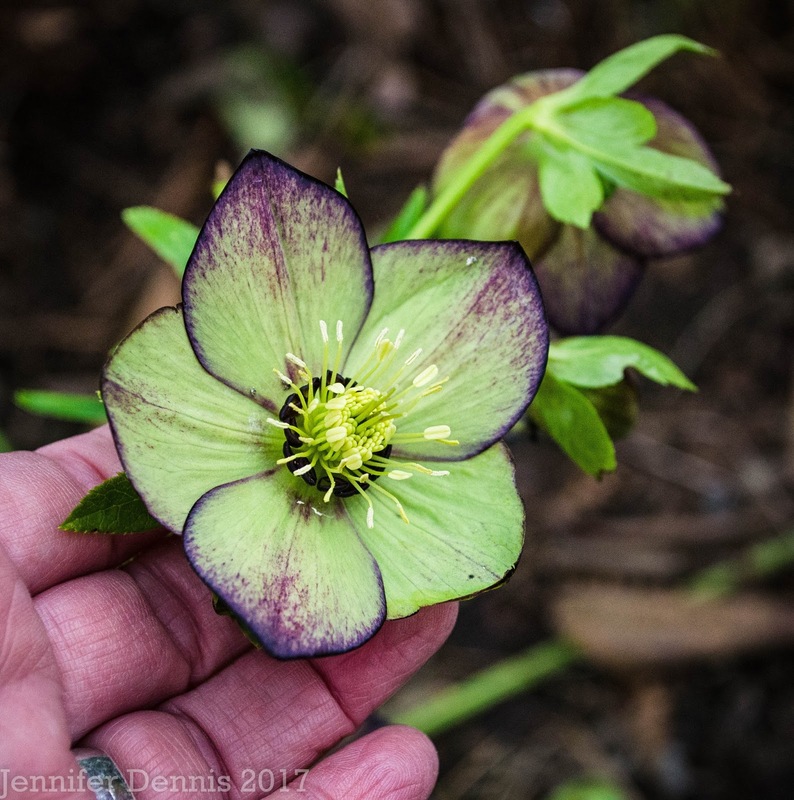 In the past, my Feburary Bloom Day posts have been filled with pretty hellebore blooms..but the garden has taken a big hit this year from frigid dry air and snow/ice storms. The blooms are behind or flat out damaged with unsightly foliage to boot. I am not sure which hellebore this is..it was labeled 'Pacific Frost' but I'm not sure if it's true. It is some variety of helleborus argutifolius corsicus. 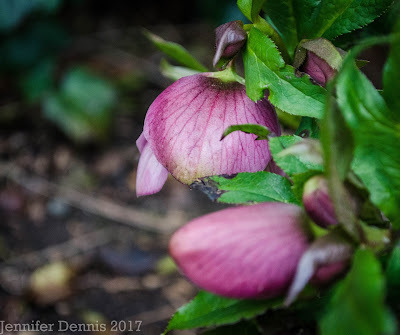 Helleborus 'Apricot Blush' from the Winter Jewel's line..based right here in beautiful Oregon, is beginning to bloom. 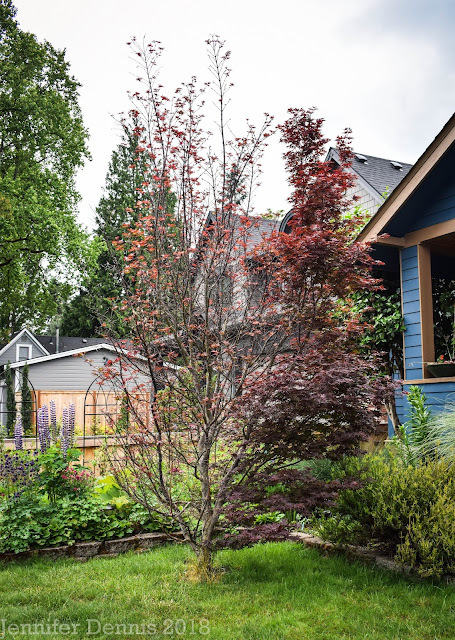 It always lightens up as the bloom ages, but this particular plant begins with a darker mauve blooms with pretty veins and a deeply hued center. Also from the Winter Jewel's line is this pretty double painted white hellebore. It was already open this time last year......this year....just starting. But, you can see the damage to the foliage from the winter weather. Just buds beginning on the 'Charlotte' hellebore from the 'Spring Promise' line. 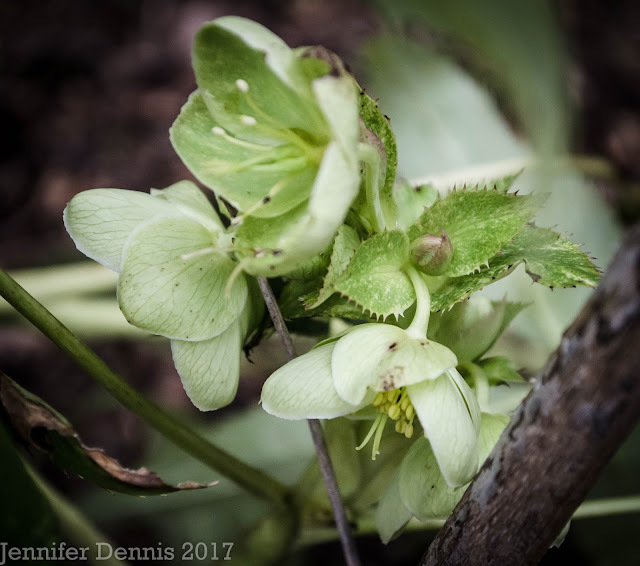 And another double white hellebore with a picotee edge.....just beginning to open after a week of sunshine after a long, cold, winter. And finally here is 'Valerie' from the Spring Promise line. She is an early bloomer and began blooming in earnest in January. I hope to make room for more hellebore varieties in the future..but that's another story. Pieris will bloom soon and so will the daffodils. When the daffodils bloom....then it will really be spring. 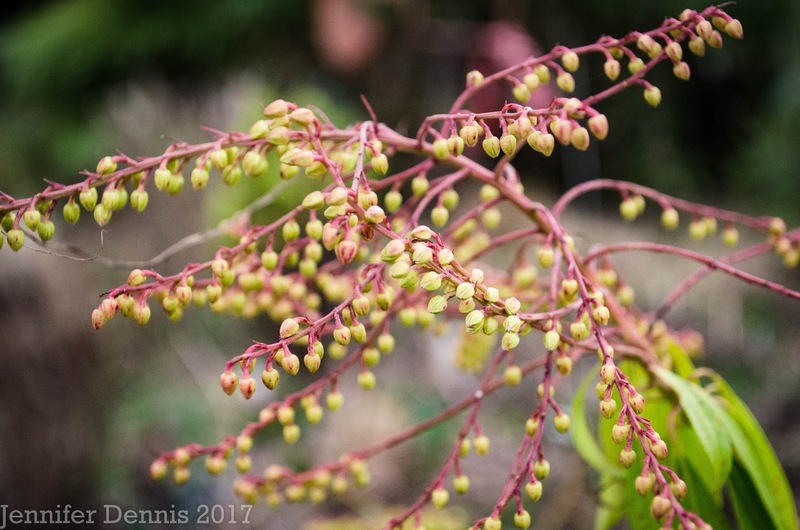 Vist Carol at May Blooms Gardens to see what is blooming around the world as garden bloggers share their bloom day posts. Happy Bloom Day Jennifer! 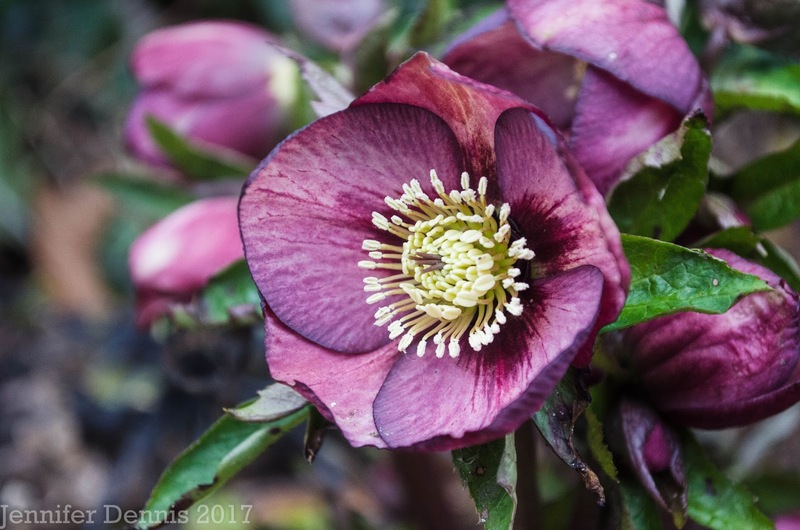 Your collection of Helleborus is wonderful and I especially like the color of the 'Apricot Blush' variety. It has been another mainly uneventful winter here on Long Island with the exception of two winter storms, one which was just last week. 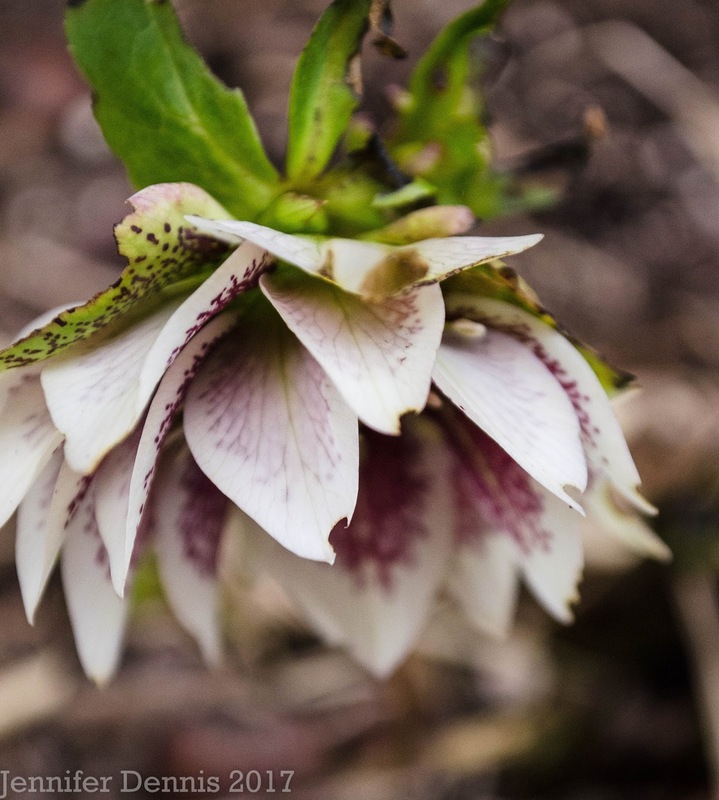 I have Hellebore 'Shooting Star' which is blooming right now in the garden. 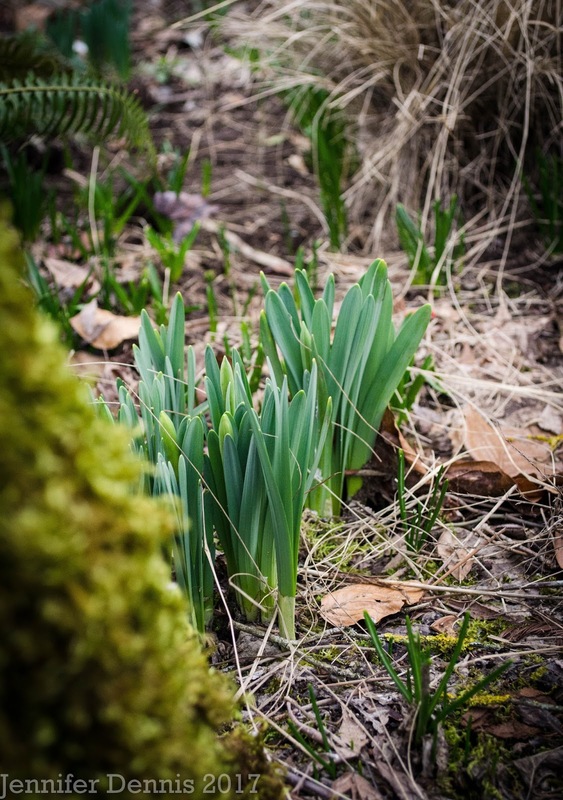 I am hoping to see Daffodil foliage coming up soon as well. Yours are a welcoming sight! It is marvelous how Hellebores are not daunted by Winter weather - they just keep on blooming! Despite the beating that your plants took in the recent weather, they've soldiered on with aplomb and are blooming beautifully. Daffodils look like they're as ready for spring as the rest of us! 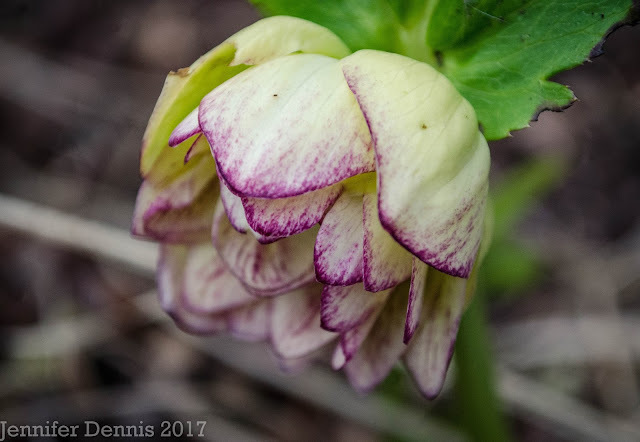 Your Hellebores may look beat up to you, but I still think they're pretty wonderful. Mine are way behind yours, and there's no sign of any bulb foliage poking up yet. Happy Bloom Day! I have to plant hellebores but have not done so yet. They are all so pretty! Phillip, once I started growing hellebores..winter was bearable! The blooms are delightful and while mine did take a hit with our wack-o weather...they are still blooming! Gorgeous, I love hellebores so much. Mine are looking equally battered but they seem to grow out of it as the season goes on. A good reminder that they generally grow out of this frazzled and weathered stage. There's hope! We're all ready, but you're a bit ahead of what's happening here...gives me something to look forward to. You have convinced me that I need several more varieties of hellebores! Thanks for joining in for bloom day! Your hellebores are scrumptious despite your nasty winter weather conditions. I really wish I had more success with them. It's not for lack of trying - I guess they just need more cold than my climate provides. I invested in a half dozen in the 'Winter Jewels' collection 2 years ago but, thus far, none have bloomed. To date, I've only had 2 plants bloom: 'Anna's Red' (which does have a single bud right now!) and a pale pink variety I got years ago from Heronswood. Wow you have beautiful blooms in your garden! I love the hellebore in the last photo. Our plants are late flowering. Our winter hasn't benn particularly cold but it has been dank and gloomy so I think lack of light has affected them. Oh, Valerie is gorgeous! Your hellebores are much further along than mine. Evan beat me to my comment - just wow! That Valerie knocked my socks off! So very, very beautiful... Fab photos of all of them - you managed to highlight only their good sides, and not the weather-bitten parts. I know exactly what you're talking about. Mine look all tattered too.